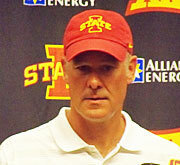 The battle against Alzheimer’s disease is personal for Iowa State football coach Paul Rhoads. The coach was in West Des Moines today to promote this summer’s Ride to Remember, a motorcycle ride through central Iowa that raises money for the Alzheimer’s Association. This year’s Ride to Remember will begin outside of Jack Trice Stadium on Sunday, June 21. This is the 6th year for the ride. This year’s date for the event coincides with Fathers Day. Registration and a barbecue will begin at noon. The ride is expected to begin at 2:00 p.m.